Kellogg was born in Potsdam, New York on December 22, 1856. His family moved to Minnesota in 1865. Kellogg was a self-trained lawyer who began practicing law in Rochester, Minnesota, in 1877. He served as city attorney of Rochester 1878–1881 and county attorney for Olmsted County, Minnesota, from 1882 to 1887. He moved to St. Paul, Minnesota, in 1886. In 1907 he was elected as a Compatriot of the Minnesota Society of the Sons of the American Revolution. In 1916, Kellogg was elected as a Republican to the United States Senate from Minnesota and served from March 4, 1917 to March 4, 1923 in the 65th, 66th, and 67th Congresses. During the ratification battle for the Treaty of Versailles, he was one of the few Republicans who supported ratification. He lost his re-election bid in 1922 and, in 1923, he was a delegate to the Fifth International Conference of American States at Santiago, Chile. In 1924, he was appointed by President Calvin Coolidge as Ambassador Extraordinary and Plenipotentiary to Great Britain, serving from January 14, 1924 to February 10, 1925. He succeeded George Brinton McClellan Harvey who served under Warren G. Harding and was succeeded by Alanson B. Houghton so that Kellogg could assume the role of Secretary of State. From 1925 until 1929, he served as the United States Secretary of State in the Cabinet of President Coolidge. In 1928, he was awarded the Freedom of the City in Dublin, Ireland and in 1929 the government of France made him a member of the Legion of Honour. As Secretary of State, he was responsible for improving U.S.–Mexican relations and helping to resolve the long-standing Tacna–Arica controversy between Peru and Chile. His most significant accomplishment, however, was the Kellogg–Briand Pact, signed in 1928. Proposed by its other namesake, French foreign minister Aristide Briand, the treaty intended to provide for "the renunciation of war as an instrument of national policy." He was awarded the 1929 Nobel Peace Prize in recognition. He was associate judge of the Permanent Court of International Justice from 1930 to 1935. Kellogg was self-conscious about his lack of academic credentials he attended a one-room country school and dropped out at age 14. He never attended high school, college or law school. His only advanced training came from clerking in a private lawyer's office. Kellogg grew up in a poor farm in Minnesota, and lacked a commanding presence or the sophistication to deal with the aristocrats who dominated European diplomacy. As Secretary of State, his main focus was Latin America, where he dealt with brutal but unsophisticated strongmen. His staff provided the ideas, and they appreciated that he was always open, candid, and easy to communicate with. He helped end the battle between the Mexican government and the Catholic Church, but failed to resolve the dispute over ownership of the oil reserves. In the Far East, he favored China and it from threats from Japan. He successfully negotiated tariff reform with China. As for Europe he was primarily interested with expanding the limitations on naval armaments that been established by the Washington Treaty; he made little progress. Kellogg gained international fame, and the Nobel Peace Prize, with the Kellogg-Briand Pact. It was endorsed by nearly every nation and made starting a war a punishable criminal action. It formed the legal basis for the trial and execution of German and Japanese war leaders after 1945. In 1886, Kellogg was married to Clara May Cook (1861–1942), the daughter of George Clinton Cook (1828–1901) and Elizabeth (née Burns) Cook (1838–1908). He died from pneumonia, following a stroke, on the eve of his 81st birthday in St. Paul. He was buried at the Chapel of St. Joseph of Arimathea in Washington National Cathedral, Washington, D.C. In 1937, he endowed the Kellogg Foundation for Education in International Relations at Carleton College, where he was a trustee. His house in St. Paul, the Frank B. Kellogg House was listed as a National Historic Landmark in 1976. Kellogg Boulevard in downtown Saint Paul. Kellogg Middle School in Shoreline, Washington and Rochester, Minnesota, as was Frank B. Kellogg High School (closed 1986) in Little Canada, Minnesota which had been a part of Roseville School District 623. ^ a b "Frank B. Kellogg Dies At Age Of 81 [sic]. Winner of Nobel Peace Prize for Pact Outlawing War, Ex-Secretary of State". New York Times. December 22, 1937. Retrieved December 16, 2014. Frank B. Kellogg, former World Court judge and Secretary of State, died at 7:28 P. M., Guy Chase, his law partner, announced tonight. ^ "The Nobel Peace Prize 1929". Nobelprize.org. Retrieved October 6, 2011. ^ a b c d e f g "KELLOGG, Frank Billings - Biographical Information". bioguide.congress.gov. Biographical Directory of the United States Congress. Retrieved May 13, 2017. ^ "Frank B. Kellogg - Biographical". nobelprize.org. Retrieved December 14, 2014. ^ "TAFT DECLINES COMMENT. ; F.B. Kellogg, in Conference with Candidate, Also Silent Now". The New York Times. July 23, 1908. Retrieved May 13, 2017. ^ "Article 2 -- No Title". The New York Times. November 21, 1909. Retrieved May 13, 2017. ^ Neubeck, Deborah Kahn. "Collection Finding Aids, Frank B. Kellogg chronology". mnhs.org. Retrieved December 14, 2014. ^ "2,000 NOMINATIONS MADE BY COOLIDGE; List Is Headed by Frank B. Kellogg for Ambassador to Britain". The New York Times. December 11, 1923. Retrieved May 13, 2017. ^ "SACASA PROTESTS KELLOGG'S COURSE; Said to Have Threatened in Message to Rouse Latin America Against Us. WILL KEEP UP THE FIGHT He Promptly Denies Story That He Is Giving Up in Face of Our Opposition". The New York Times. January 15, 1927. Retrieved May 13, 2017. ^ Times, Wireless To The New York (November 29, 1930). "KELLOGG TO GO TO OSLO. ; But Nobel Peace Prize Winner Is Uncertain When He Can Pay Visit". The New York Times. Retrieved May 13, 2017. ^ Times, Wireless To The New York (November 27, 1929). "Kellogg Gets Honorary Degree at Oxford; Outstanding Candidate for Nobel Peace Prize". The New York Times. Retrieved May 13, 2017. ^ Photo, Manley O. Hudson, Bemis Professor Of International Law, Harvard Law School times Wide World (October 12, 1930). "WHO'S WHO OF THE JUDGES ELECTED TO WORLD COURT; FRANK B. KELLOGG". The New York Times. Retrieved May 13, 2017. ^ Kellogg, Frank B. (December 24, 1933). "THE ROAD TO PEACE". The New York Times. Retrieved May 13, 2017. ^ Times, Special To The New York (February 27, 1934). "CABINET MEMBERS EXPLAIN NEW DEAL; Cummings and Roper Urge at Rollins College Education as Aid to Government. BOTH RECEIVE DEGREES College at Founders' Day Celebration Honors Frank B. Kellogg for World Peace Efforts". The New York Times. Retrieved May 13, 2017. ^ Installation ceremony of Frank B. Kellogg at Permanent Court of International Justice, The Hague (1930), at YouTube. ^ Edward Mihalkanin, ed., American Statesmen: Secretaries of State from John Jay to Colin Powell (2004) pp 293-98. ^ "MRS. F. B. KELL0GG, DIPLOMAT'S WIDOW; Was Hostess for Her Husband Co-Author of Peace Pact and Ex-Secretary of State DIES AT ST. PAUL HOME Aided Mrs. Coolidge at White House FetesmCouple Marked 50th Anniversary in 1936". The New York Times. October 3, 1942. Retrieved May 13, 2017. ^ Denslow, William R. (1957). "10,000 Famous Freemasons". The Phoenixmasonry Masonic Museum and Library. Macoy Publishing & Masonic Supply Co., Inc. Retrieved November 10, 2014. ^ Times, Special To The New York (June 8, 1937). "CARLETON COLLEGE GETS $500,000 GIFT; Frank B. Kellogg Establishes Unit for Study of International Relations". The New York Times. Retrieved May 13, 2017. ^ "Frank B. Kellogg House". National Historic Landmark summary listing. National Park Service. Archived from the original on April 3, 2008. Retrieved January 8, 2008. ^ Millett, Larry (2007). AIA Guide to the Twin Cities: The Essential Source on the Architecture of Minneapolis and St. Paul. Minnesota Historical Society Press. p. 142. ISBN 0-87351-540-4. Ellis, L. Ethan. “Frank B. Kellogg” in An Uncertain Tradition: American Secretaries of State in the 20th Century. ed. Norman A. Graebner. (1961) pp 149-67. Rhodes, Benjamin D. United States Foreign Policy in the Interwar Period, 1918-1941: The Golden Age of American Diplomatic and Military Complacency (2001) pp 57-72. 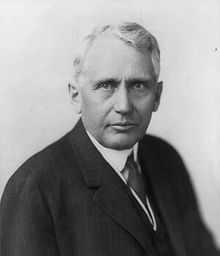 Wikimedia Commons has media related to Frank B. Kellogg. United States Congress. "Frank B. Kellogg (id: K000065)". Biographical Directory of the United States Congress. This page was last edited on 19 March 2019, at 23:35 (UTC).